It's been almost one year I had touched for last time draft version of this article and thanks to couple days of free time I could finish it so I'm happy that it will not remain as unfinished symphony :-). Everybody talks today about upgrade Oracle Database to 12c or discussing many new features of 12c, no matter if they are interesting or not so interesting, really important or not so important, extra paid or not. You've decided that you can rely on new version, it seems stable, you gained sufficient information about new and obsoleted/deprecated stuff and made couple of tests of upgrade process on your testing environment. Everything looks fine, so you proceed to real upgrade. Database is upgraded and everything seems to be OK but your applications and colleagues are reporting problems with access to freshly upgraded database. Well... database upgrade is not just about database upgrade. This error is thrown when used version of authentication protocol by client does not meet minimum authentication protocol allowed for clients. In 12cR1 comes with default settings for minimal version of authentication protocol set to 11, thus all clients which are using older version (older than 11g) will produce above error. This error is thrown when you are using database link to older release for the same reason as in previous case. Password versions problem. Upgrade your client (at least to 10gR1 version) as it's obviously older than old. Note that above parameters in sqlnet.ora are just bloody workaround, it's not a solution. By setting of lower version by these parameters you've just bought a uncertain amount of time. Again I suggest to check the MOS Doc ID 207303.1. In this part we take a look at some possibilities how to get more information about clients in order to identify who and what is using old client and which version client is used for particular session. For that purpose we can use (G)V$SESSION_CONNECT_INFO (view based on X$KSUSECON) which since 11gR1 version is a great source of additional information about connections. This view (and X$ table) has been present even in earlier versions of Oracle Database (AFAIK I've seen it in 9i) but since 11gR1 provides more detailed thus useful information. For our report we will use it in combination with (G)V$SESSION view. According to above output we can easily identify servers which are using older version of Oracle Database client, older than 11gR1 to be precise. That session have the "Unknown" value in second column. And also we have other useful informations about client usage. For example, when we look at columns MACHINE, MODULE, PROGRAM, CLIENT_CONNECTION (CLIE column in above output) we know that sessions from OEL01 server are established from an Apache server which is running application (we can guess that there is some fastcgi, PHP, PL/SQL or other Apache module) and some other (probably standalone) application and both of them are using OCI connection. OK, this report is fine but it covers only current sessions but we can have clients/application/users which are connecting iregulary or occasionally. So we need to be sure that we can identify the most of older clients as we can but this good concept for further step which will be automatic gathering of information. For purpose of recording information about old clients we may use AFTER LOGON trigger. Note that On-logon trigger can produce/add some overhead (in case of frequently connecting applications), so it's important to keep it as minimal as it's possible and do only necessary work. Logging is executed for all users except SYS, you might consider to reduce number of users if you are sure that no old client is connecting to particular user. I've used information from SYS_CONTEXT instead of joining the V$SESSION view. The side effect of this change is that we lost PROGRAM column but at the same time we've got HOSTIP column with an IP address. Also you should keep the T_OCICLIENT_INFO table as small as possible and that's the reason why I added the "not exists" condition (you can remove it, so no checking for existing entry, just pure insert for each session) and also you can limit number of rows in table by removing "OSUSER=sys_context('USERENV', 'OS_USER')" from conditions. Also keep on mind that only 10gR2 and older clients will be logged (as the client version number is returned for 11gR1). And finally note that this is a my way, perhaps it might not be a best way but from my point this was effective solution, as always you can choose your own way. Now you need to give some time in order to log most (ideally and hopefully all) of the clients. OK, we have got identified all clients older than 11gR1 and I hope (or believe) that previous part is sufficient for you. But there could be some reasons when you might need to know exact version of Oracle database client. which can work with (or supports) the 12cR1 database but it's not so easy to replace the client or there could be another issue or reason typical for corporate environment (My story was that somebody didn't do his job by providing required information/action and I couldn't wait with the upgrade any longer so I had to know what to expect after upgrade thus prevent some unexpected behaviour due to old client). By knowing of exact version we can better predict and address potential implications, issues or bugs (for example by checking existing bug database or knowledge base at MOS site) for that client version. Question is how we can detect version remotely? What exactly we are looking for? And thanks to my little research (for security related reason) more than ten years ago I knew where to start. For better understanding we have to get answer for those two questions and to answer these questions we can use output from good old SQLNet (server) tracing. I've used 10gR2 client and 12cR1 database for that purpose. In produced trace file we will focus on handshake/negotiation phase where can find the needed hint(s) (Note I'm not going to explain whole structure of trace information nor detailed description of packets, it's not an topic and also it would need separate article for full topic coverage and that's not my intention). 2. This information doesn't provide exact version number. 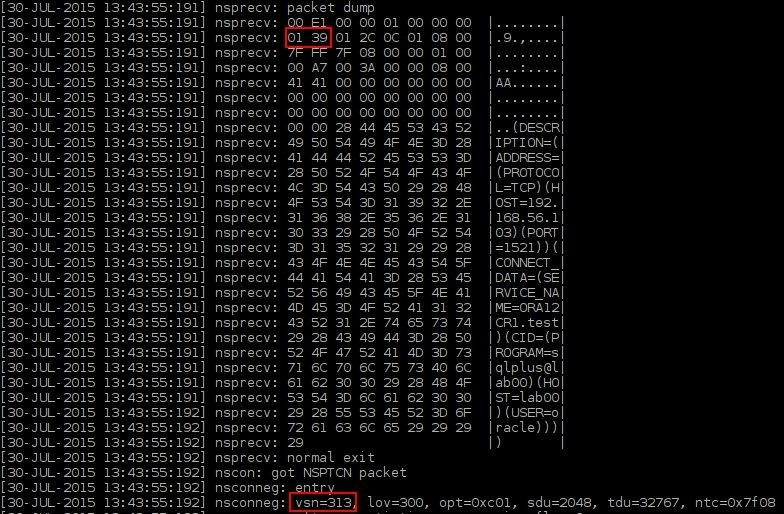 Now let's check the trace file again and the corresponding packet in order to find out the location of this information. Now we can use this information as input to search in the MOS bug database or knowledge base to find out existing or known issues associated with this version. Maybe you ask why Oracle clients version 10gR2 and below have "Unknown" value instead of version number. Answer for this question can be found in trace file as well but we have to use 11gR1 client or later. For this purpose I've created another trace file using the 11gR2 client. As you can see at the picture above there is SESSION_CLIENT_VERSION sent with the value 186647552 which is decimal representation of Oracle version. When you check SQLNet server trace files for clients older than 11gR1 you will find that this information is missing there and that's the reason for an "Unknown" value. Now we have to solve the question how to collect these information automatically and what tools we need to use for that purpose. Based on above points it's clear that using of server side sqlnet tracing is pointless as it conflicts with a, b and c.
As the Database is running on Linux box with the 2.6 kernel so I chose the solution based on combination of iptables/netfilter (local firewall) and wireshark. Of course in case of different OS I would have to choose different solution. I've created a new ORATRACE chain. All established connections from three specific hosts (logged in systools.t_oclient_info - see the first section of the article) which are connection to port 1521 (where the Oracle Listener is listening) are redirected to ORATRACE chain. Each packet which comes to ORATRACE chain is checked (using of Knuth–Morris–Pratt string searching algorithm) for presence of the "DEADBEEF" sequence. If this sequence has been found packet is logged using NFLOG. Note that this setting is not permanent use iptables-save in order to save this configuration. Now we can periodically check the oracle_clients.log file and if there is existing entry for specific source IP address we can remove specific rule for that address from the iptables (You can eventually write and setup script for that purpose). Now we check what we've got. 0050  d4 00 09 00 45 00 00 d0 13 b4 40 00 40 06 34 bb   ....E.....@.@.4. 00d0  02 00 01 00 03 00 00 00 00 00 04 00 05 0a 20 04   .............. . According to above output host 192.168.56.1 is connecting using 10.2.0.4 version of client, host 192.168.56.101 using 10.1.0.5 and third host 192.168.56.102 shows is using 9.2.0.8 version of client (which makes him #1 candidate for client upgrade). Be aware of that as Oracle Database comes with new features by each release, it also comes with changes in SQLNet protocol (since 11gR1 it has changed significantly), changes of default settings (SDU for example) and changes in authentication. Keep on mind these facts when you plan to upgrade your Database so you have to put a spotlight on Database client as well. It's possible to upgrade clients after upgrade of Database but I suggest to do that as first step (before Database upgrade) whenever it's possible. Otherwise you should be at least aware of possible consequences and implications of using older client version.